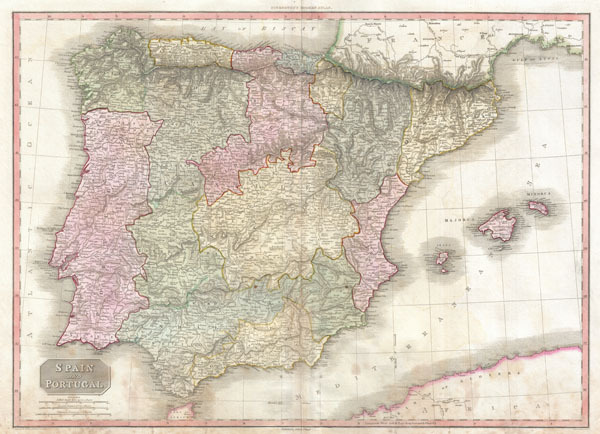 John Pinkerton's highly decorative map of Spain and Portugal, published 1818. Covers the entire region in considerable detail with political divisions and color coding at the regional level. Includes parts of adjacent France and Africa. The Balearic Islands of Ibiza, Majorca, and Minorca are shown prominently. Identifies cities, towns, castles, important battle sites, castles, swamps, mountains and river ways. Lower left hand quadrant features three scales, British Miles, Spanish Leagues, and Portuguese Leagues. Drawn by L. Herbert and engraved by Samuel Neele under the direction of John Pinkerton. This map comes from the scarce American edition of Pinkerton's Modern Atlas, published by Thomas Dobson & Co. of Philadelphia in 1818. Very good condition. Minor damp staining in lower quadrants. Some transference. Blank on verso. Rumsey 0732.019. Phillips (Atlases) 724. National Maritime Museum, 409.